Why is it called "Light the Night?" Did you know that Light the Night used to be called the Unhalloween Party? It was still basically the same thing that it is now with a different name. That name sounds odd to me now even though I remember when it seemed crazy to change the name. Look, it's true. We aren't really Pro-Halloween. It can be a night where some really wicked things are celebrated. But I do think the name Light the Night changes our perspective for why we do the event. We aren't just wanting to hide away and protect ourselves from the great evils of Halloween. We are trying to brightly shine the light of Jesus to a dark world. And, did you know that today Calvary Church officially turned 87 years old? This calling to reach the world for Jesus has been at the core of our purpose as a church since the very beginning in 1931! That's a gentle but not so subtle reminder that God has called us to shine like stars in the universe for Him. Jesus calls us to be in the world but not of the world. The Holy Spirit empowers us to take the good news of salvation to a world that is attempting to satisfy itself with worldly pleasures—through things as innocent as Halloween candy to much more dangerous masks for our true and deepest need. 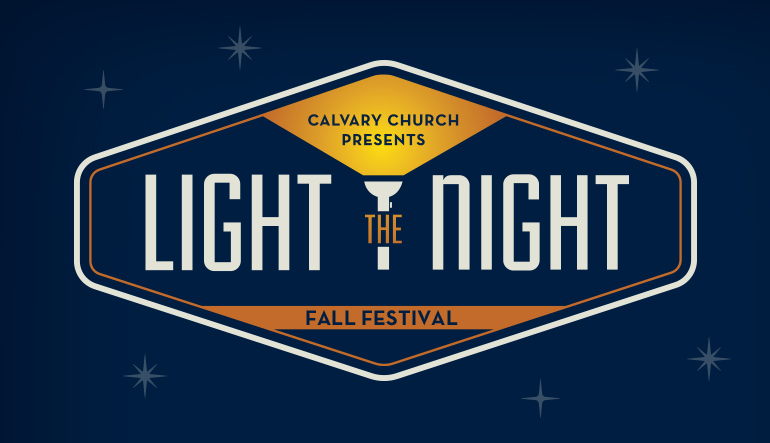 So let's remember that Light the Night is coming soon and it's a wonderful opportunity for Each One to Reach One with a friendly invitation to an incredibly fun night here at church. Who will you invite to Light the Night? Sign up to receive the weekly Calvary email of the Pastor's Blog to get biblical insights and ministry updates on life at Calvary as we follow Jesus together.